Curiosity has used devices found in smartphones to measure slight variations in gravitational fields refining the understanding of how Gale crater and the mountain at its centre were formed. Clever use of non-science engineering data from NASA’s Mars rover Curiosity has let a team of researchers, including an Arizona State University graduate student, measure the density of rock layers in 96-mile-wide Gale Crater. The gravitational field sensed by the rover as it traversed across the Martian crater’s dusty basin indicates that the underlying sedimentary material is relatively porous, disproving a theory that the crater floor was once buried beneath several kilometres of rock. The findings are due to be published in the on February 1st in the Journal Science. Since making planetfall in 2012, the Curiosity rover has been exploring the complex landscapes within Gale crater, a dry ancient lakebed. The rover has also been exploring the area surrounding Aeolis Mons (Mount Sharp), the 5-kilometre-tall mountain that forms a central peak in Gale crater. 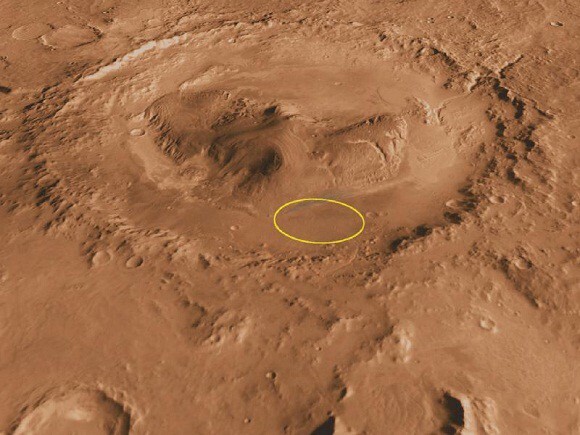 The origin of Mount Sharp is hotly debated; since the peak’s summit is higher than much of the crater’s rim, some researchers have suggested that the crater was once filled with sediment and the current topography is a result of erosion. Others have argued that wind-blown sediments collected at the crater’s centre, slowly building the Mount Sharp to its current altitude. Like a smartphone — but smarter. Gravimetry, the precise measurement of tiny variations in gravitational fields, can be used to weigh mountains by detecting the density of subsurface materials. Orbital gravimetric surveys have been used to probe extra-terrestrial geology, but they lack the detail of the ground-based measurements available on Earth. 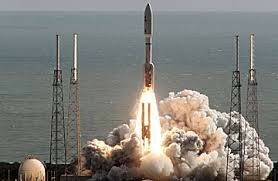 However, when Curiosity left for Mars, it left its gravitational acceleration measuring tools behind. Kevin Lewis of the John Hopkins University, the paper’s lead author, and his colleagues devised a way to recalibrate the rover inertial measurement units (RIMUs), a set of accelerometers used for routine navigation, to measure local changes to the gravitational field. The RIMUs are much like those found in every smartphone determining its orientation and motion. Curiosity’s sensors do the same, but with much greater precision, helping engineers and mission controllers navigate the rover across the Martian surface. But while the rover is standing still, the accelerometers can also measure the local force of gravity at that spot on Mars. The new findings suggest Mount Sharp’s lower layers have been compacted by only a half-mile to a mile (1 to 2 kilometres) of material — much less than if the crater had been completely filled. This reveals low-density porous rocks beneath the rover and as deep burial would have compacted the rocks to a higher density, this indicates that only a fraction of the crater was ever filled in the past. This adds support to the model that proposes Mount Sharp formed largely in its current form, as a free-standing mound within Gale. Shortly after taking the incredible selfie comprised of 57 different images (top of the page)with its Mars Hand Lens Imager (MAHLI) camera on the end of its robotic arm on January 15th, Curiosity moved from the twisting Vera Rubin Ridge, the rover’s home for more than a year, and descended toward a clay region of Mount Sharp. 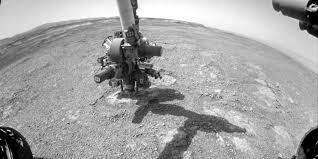 On December 15th, Curiosity drilled its 19th sample at a location on the ridge called Rock Hall. The “Rock Hall” drill hole is visible to the lower left of the rover; the scene is dustier than usual at this time of year due to a regional dust storm. Curiosity has been exploring the ridge since September of 2017. It’s now headed into the “clay-bearing unit,” which sits in a trough just south of the ridge. Clay minerals in this unit may hold more clues about the ancient lakes that helped form the lower levels on Mount Sharp.